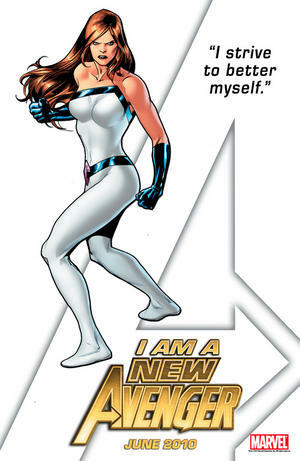 Jessica Jones is a New Avenger. Like much of fandom, I’ve been eagerly awaiting the lineups of the new Avengers squads that have been slowly rolling out these last couple weeks. There is one particular teaser that got me incredibly excited though—that of Jessica Jones returning back to the world of costumed heroics as a member of the new New Avengers. Obviously, this is a move that Bendis has been pushing one of his signature creations towards for a long time, but I never expected she would join her husband on what appears to be his team. Or that Cage would be pulling double duty on this team and the Thunderbolts unit. Great surprise though and Stuart Immonen’s artwork is as glorious as ever. Know some people have been bitching about this latest development, saying that it flies in the face of everything established in Alias, or some other similar bit of nonsense. Which is dumb for several reasons, as anyone that’s been following the character knows this is a natural outgrowth for her and will be incredibly fun to watch. Out of all the things revealed to this point, the potential for the Luke/Peter/Jessica dynamic out in the field is well worth four books a month. JMS Takes on Superman and Wonder Woman. Now this is what the people have been waiting for since JMS came over to DC. No disrespect to the Red Circle characters or The Brave & The Bold, but Straczynski is one of the most accomplished writers of our time, and the possibilities for greatness will only be expanded the more projects he gets his hands on. By giving him two of the biggest and most influential comic characters ever, DC has created an environment where JMS is writing Superman and Wonder Woman, Morrison is writing Batman, Johns has turned Green Lantern into one of the biggest franchises in comics, in addition to returning back to The Flash. The creative landscape there on their core properties is really just astounding recently, and everyone appears to be in great hands. Remember how there was this creative shockwave on books like Amazing Spider-Man and Thor the second JMS took over? Pretty sure that’s about to happen all over again. Fantastic move, hope they give him a couple great artists to work with. JRJR is the artist on Avengers. I can’t think of another Marvel artist more appropriate to headline the triumphant return of the kind of “old school” approach to the Avengers that some people still claim has been in short supply ever since Bendis took over. Yes, these are the same people that are also still ignoring the fact that the writer re-invigorated the franchise so much that it can now sustain 3 or 4 main titles, but they’re probably right in saying that he “destroyed” the Avengers. Anyway, so now the Avengers are going back to the old school, and the book is still written by the same guy that supposedly took that vibe away in the first place. That’s irony, isn’t it? Well, look at it this way…with Romita on art chores, irony will never have looked so good. And I’m assuming it’ll always be on time. Azzarello Brings a First Wave of Pulpy Goodness. Could be a residual effect from my recent completion of 100 Bullets (more on this in a dedicated column), but I’m extremely excited about Azzarello’s new venture in his own little pulpy corner of DCU’s multiverse. Funny thing is that I’ve never had any great interest in either Doc Savage or The Spirit, but I’m getting at least the first three issues of both series on the strength of Azzarello’s notes, and the beautifully illustrated first issue. Getting a real Batman: The Animated Series vibe off of it, and I’m definitely intrigued by a version of Batman that uses guns. And how cool would it be for Eduardo Risso to handle one of The Spirit back-ups, or even possibly reuniting with Azzarello for a First Wave Batman series? Lot of possibilities here that I expect to see unfold over the coming months. Fraction & Ferry on Thor. Perfect pairing in my opinion. Most of you know how much respect and admiration I have for Matt Fraction’s work and his ascension at Marvel, so I’m a bit preconditioned to anticipate all his many projects. But one of my favorite things I read from him in the last couple years was his series of Thor one-shots, and his Secret Invasion: Thor mini. Even back then, it seemed as if they were grooming him for the regular gig, so it was no surprise when they announced he would take over for JMS. What was a surprise was the recent announcement that Pasqual Ferry will be handling the art, and somewhere nearby should be the fantastic piece of art Marvel unveiled. 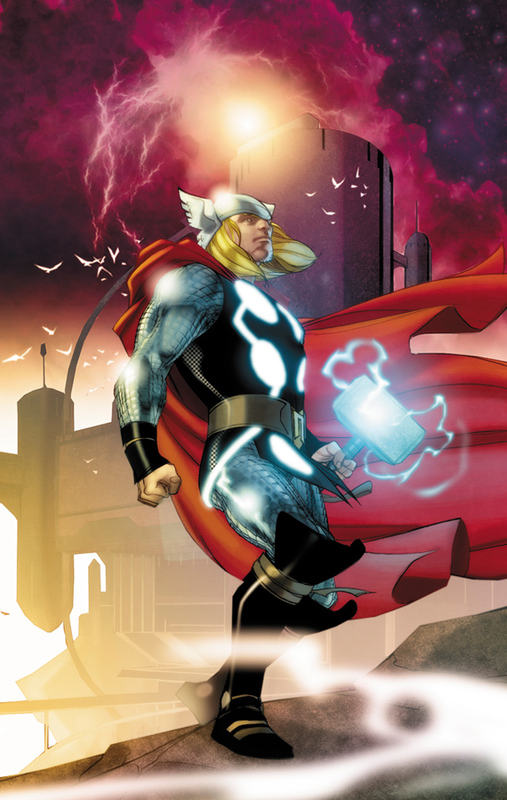 Lovely, lovely work that merges Coipel’s new costume with visual elements from the Ultimate version of Thor. And Fraction’s description of his overall approach to the book brings back fond memories of his promo interviews for Invincible Iron Man and The Order. Just from hearing him talk about the project assures you it’s gonna be plenty awesome. Now we just need that big Casanova announcement and all will be quite well. David Finch Covers the DCU’s Brightest Day. Very excited about Brightest Day, and a huge reason why is the opportunity to see Finch draws any and all corners of the DCU. After so many years at Marvel, seeing him work his magic on DC’s stable of characters will be a treat. Lee Ferg loves his artwork and actually sent me a copy of Finch’s High Voltage art book for Christmas, and do you know what it’s filled with? 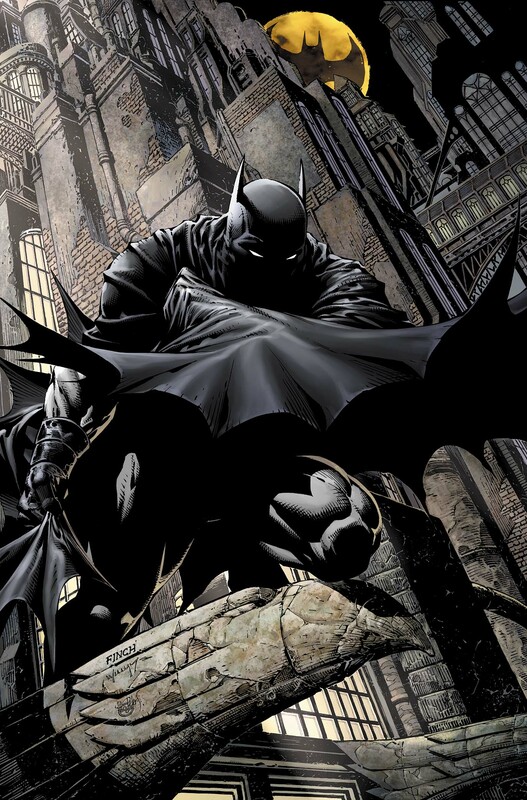 Pages and pages of so very incredibly awesome Batman art. After he gets a good handle on everything, the Batman books would be a great place for him to land next. THIS JUST IN: Before this could officially post, DC released Finch’s cover for Batman #700, and as you can see, it’s quite glorious. This image comes courtesy of DC’s The Source blog of course.